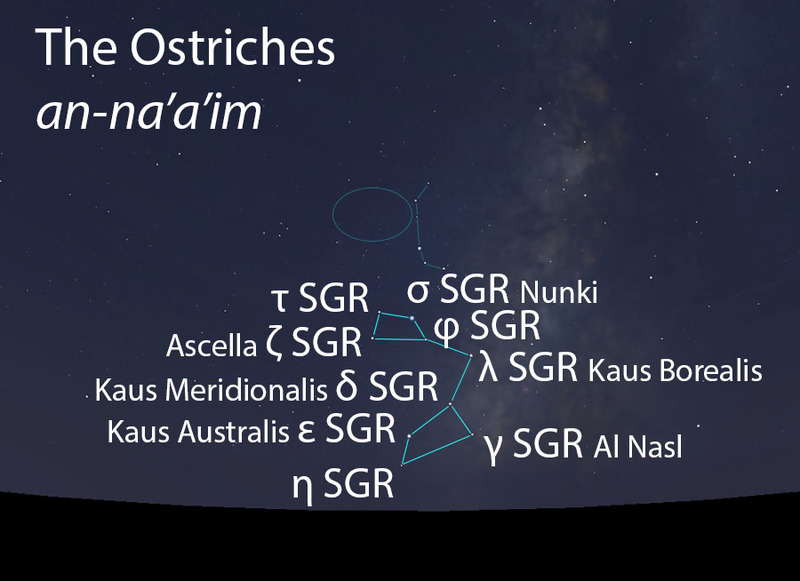 The Ostriches are the primary elements of a celestial complex that also includes the Nest (al-udhi) of the ostriches and the Wasteland (al-balda). Unlike the Lion or the Scorpion, each star of the Ostriches represents an individual ostrich. The Ostriches are divided into two groups, four Drinking Ostriches (an-na’am al-warid) and four Returning Ostriches (an-na’am as-sadir). The 9th star lies above and between the two groups, connecting them without necessarily being an ostrich itself. Two groups of four bright stars, each arranged as a quadrilateral, with a ninth star connecting the two groups. 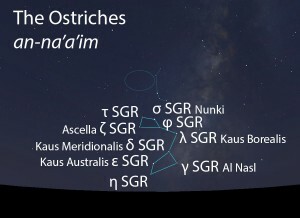 The Ostriches are the primary stars of the Ostriches (an-na’a’im, النعائم) folkloric celestial complex.